“This is a movement founded on love and grounded in the nobility and dignity of every human life,” President Trump said in a pre-recorded message to the massive Jan. 18 rally. 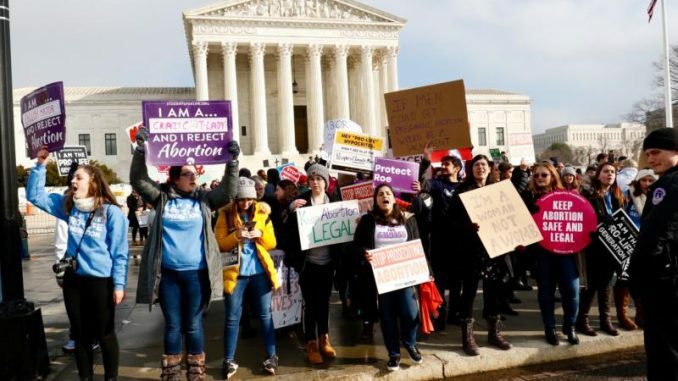 Washington D.C., Jan 18, 2019 / 01:05 pm (CNA).- The March for Life again gathered myriad pro-life advocates to mark the anniversary of legalized abortion in America, and in a surprise appearance Vice President Mike Pence and Second Lady Karen Pence introduced a pre-recorded message from President Donald Trump. “This is a movement founded on love and grounded in the nobility and dignity of every human life,” President Trump said in a pre-recorded message to the massive Jan. 18 rally, before the crowd began its march through the streets of Washington, D.C.
“I will always protect the first right in the Declaration of Independence, the right to life,” he said. Trump touted his administration’s new expansion of the Mexico City Policy, which restricts funds for international organizations that promote or perform abortions. He promoted his administration’s actions to protect religious freedom for medical professionals and religious charities, as well as support for adoption and foster care. Among new proposals are limits barring Title X funds for clinics that perform abortions; and making permanent the Hyde Amendment budget restrictions on abortion funding. Trump is something of an unlikely ally for the pro-life movement. Before he launched his successful 2016 presidential campaign, Trump had a record of pro-abortion rights statements. That record, his personal character and other actions have drawn criticism and concern from some pro-life leaders. His presidency continues to be one of the most controversial in recent history, with his anti-immigrant crackdowns and rhetoric becoming major concerns for Catholic bishops. For the 2018 March for Life, Trump had given a special live address to the March for Life rally from the White House Rose Garden. Vice President Mike Pence and Second Lady Karen Pence appeared in person to introduce the president and to give their own remarks. “They will attack you, they will question your hearts to silence others but don’t listen to them. Listen to the truth,” he said. He told marchers that God will not forsake them and they do not stand alone. Pence similarly touted Trump administrative actions, saying Trump “kept his promise” on judicial nominees and signed legislation allowing states to defund abortion provider Planned Parenthood. Other elected officials spoke at the event, among them U.S. Rep. Chris Smith R-N.J., a co-chair of the Bipartisan Congressional Pro-Life Caucus. U.S. Rep. Dan Lipinski, D-Ill., another co-chair of the House’s pro-life caucus, addressed the event. Lipinski is regarded as a leader among pro-life Democrats. In a tight 2018 primary election, he defeated a strong challenger who was pro-abortion rights. Louisiana State Rep. Katrina Jackson, a Democrat, claimed Louisiana was the most pro-life state. “It doesn’t matter if you’re Democrat, Republican, black or white, we fight for life,” she told the crowd. “When people ask me ‘Why are you a black female Democrat fighting for life?’ I say ‘Because I’m a Christian first’,” Jackson said. Ben Shapiro, editor-in-chief of The Daily Wire and host of a popular conservative podcast, faulted the Democratic Party’s strong pro-abortion rights stand, but also challenged Republican legislators’ failure to defund Planned Parenthood. “We stand between America and the darkness, and we will march until that darkness is banished forever and all our children can stand in the sunlight,” he told the marchers. He also asked eligible men to join the Knights of Columbus, which has about 1.9 million members worldwide. The group’s many friends and allies spoke out after a controversial December Senate Judiciary Committee hearing in which two Democratic senators had questioned a judicial nominee’s membership in the Knights due to their views on abortion rights and marriage. Dr. Kathi Aultman, a former abortionist and fellow of the American College of Obstetricians and Gynecologists, reflected on her journey away from performing abortions. “If it was wanted, it was a baby. If it wasn’t wanted, it was a fetus,” she said. While qualms about abortions arose during her neonatal rotation, when she tried to save babies the same gestational age as those she was abortion, only the birth of her daughter made her stop performing abortions. After realizing that women who kept their babies did better compared to those who had sought abortions, and watching nearly aborted children in her church grow up instead, her views began to change further. Caring family and friends brought her fully to the pro-life cause. The event emcee Jeanne Mancini said the country was “forever changed” by Roe v. Wade. “Since that time, we have tragically lost over 60 million American children, little girls and little boys, to abortion. And many mothers and fathers regret having been involved in abortion,” she said. She encouraged marchers to share their story on social media, using the hashtag #WhyWeMarch. Dr. Alveda King, a niece of slain civil rights leader Rev. Martin Luther King, Jr., led the closing prayer. Life is sacred and precious. Did you even look at the picture you posted for the right to life march? Cavorting with the Devil. America has never looked like this with two prolific liars in the WH. It was said recently by former CIA Director Jim Clapper that “these elected officials are lying so much that our country may be security exposed by confusing both our allies and our adversaries with false information”. Pence clings to every falsehood uttered or Tweeted by Trump. And we don’t have “two prolific liars” as President and Vice-President now – so that’s Lie No. 2 in your post above. Vice-President Pence and Mrs. Pence both spoke TRUTH to the March for Life participants last week. It seems as though what REALLY gores your ox (so to speak) is that, for the first time since the infamous “exercise in raw judicial power” of 22 January 1973, we have a President and Vice-President who both seem to “walk the walk” as well as “talk the talk” on pro-life issues, and will speak the truth on those issues publicly – clearly, unambiguously, and courageously, as they did at March for Life last Friday. Guess who’s cashing in on contraception?